Creative Book Builder - All about apps in YOUR classroom! Creative Book Builder is a fantastic app that allows students to create books in epub format, which can then be exported to iBooks and shared with others. There are a variety of instructional uses for this app, from using it as a publishing tool for project-based learning to a summative assessment at the end of a unit. Students can embed images, audio files, video files, and write text. The advantage of an epub document over a PDF document is that all of the media will be preserved and available for readers to interact with when the final product is published. Use Creative Book Builder to have students design an eBook to educate others about a core content topic. 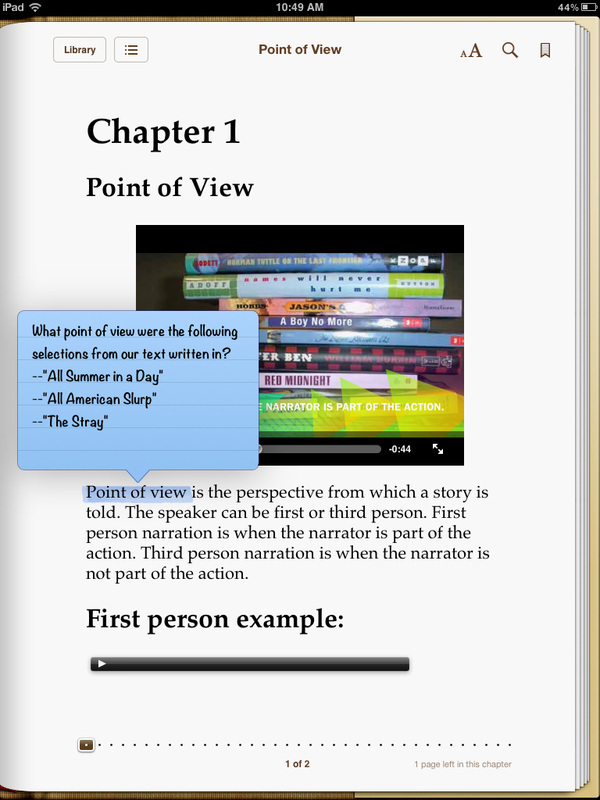 Students could develop text, video, and audio to embed in their book. Science students could formulate a hypothesis for an independent experiment, assemble their data, then write about their results. Language Arts students could write their own narrative, create a video to embed that depicts their favorite scene, and design effective illustrations. Use Creative Book Builder in a Social Studies classroom by having students argue that a controversial historical figure is either a hero or a villain. Have student support their position by creating audio recordings as the historical person, write text to defend their claim, and embed a student-created propaganda video. Use Creative Book Builder in a Math classroom to assess a real world problem, evaluate possible solution methods, and then select the most efficient way to solve the problem. This could be done using a variety of text, audio, and video elements. Use Creative Book Builder in a Language Arts classroom to compare and contrast characters by embedding a video of students giving short character monologues, and examine the credibility of characters by writing text. Include audio recordings of character dialogue to differentiate between character traits. Use Creative Book Builder in a Math classroom to compare and contrast different methods of solving problems. Students could write text directions for several different solution methods, then embed video of themselves using each method. Use Creative Book Builder in a Science classroom to embed video of an experiment, question (hypothesize) results using an audio recording, and examine data to form a conclusion that can be written out in text. Use Creative Book Builder in a Math classroom to write the order of operations in text, illustrate the steps, and embed a video of a student demonstrating how to solve an equation using a white board. Use Creative Book Builder in a Language Arts classroom to dramatize the literal and figurative meanings of text by embedding student-created videos, then write and record audio examples of similes, metaphors, personification, and hyperbole. Use Creative Book Builder in a Math classroom to explain the Pythagorean Theorem in text, classify the types of triangles that appear in real world objects (portrayed in photos taken by students), and describe how to solve a problem using the Pythagorean Theorem by embedding a student created video. Use Creative Book Builder in a Language Arts classroom to identify the literary devices used in a particular poem using audio recordings and images, and paraphrase the poem for understanding using text. Use Creative Book Builder in a Social Studies classroom to locate ancient Greece on a map, discuss the impact settling on the coast had on ancient Greeks in text, identify trade routes on a map, and describe the cultural diffusion process between Greece and other civilizations by embedding a student created video. Use Creative Book Builder in a Language Arts classroom to define the various types of narration (first and third person point of view). Have students record/state audio examples of first and third person texts, list pronouns associated with each type of narration, and embed images to help them recall the differences between each. Use Creative Book Builder in a Science classroom to define vocabulary associated with the classification of substances, list substances that would fall into each category by recording audio, and embed a student-created video to illustrate the differences between liquids, solids, and gases. In any content area, have students create a dictionary of relevant vocabulary terms. This first image shows the app interface as an eBook is being created. On the left, there is room for multiple chapters, and on the right is the list of content (and the type of each piece of content) within a chapter. This chapter has text, a video clip that was created in iMovie, and audio recordings that were created within Creative Book Builder. The following image shows the look of the eBook once it's been exported to iBooks. This is the first page of content within the chapter on Point of View. 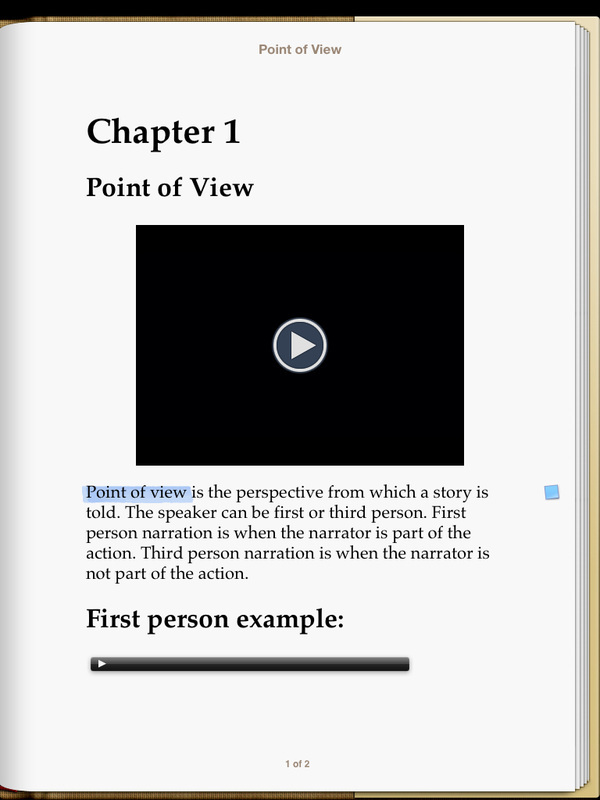 The following image shows the embedded video clip playing in iBooks, and the blue pop-up box is a task note that was added in iBooks after the author exported their Creative Book Builder project. How do you export a finished book to multiple iPads? 1. Sync through iTunes. Do you have a master laptop or computer that all of your iPads occasionally sync with? Once the CBB books are placed in the "books" folder in iTunes, you can push all of the books out to each iPad. 2. Post the ePub files on a website and make them available for download. For example, on this page I posted a finished sample ePub. If you click to download it on a computer, it doesn't do anything. But if you tap to download it on an iPad, once the file loads, your iPad will ask you how you would like to open the file, and you simply have to select iBooks. Once you've done that, the book will remain in iBooks until you remove it. If you don't currently have a website you use with students, www.weebly.com is a great company that allows educators to have free websites. Their builder is a drag and drop program that is super easy to use, and has a user-friendly file download option you can embed on your webpage. Email Jessica Pack with any questions you have about how to use this app in your class, or if you would like more specific suggestions for how you can use this app in your content area.